Panang Curry is my all-time favorite curry. Before heading to Thailand for my Peace Corps service, this was pretty much the only dish that I would order from the Thai restaurants back home … well, that and Pad Thai. The flavor was always fantastic no matter what restaurant I tried. It never let me down. So, if you’re up for a warm and savory curry known more for its depth in flavors than for it’s spice (though you can make it spicy if you want!) definitely check this out! Heat pan/wok on medium-high heat, then add ½ cup of coconut milk. It should sizzle right away and start to boil; add paste and mix well. Fry the paste in the pan. Keep adding a bit of coconut milk every minute or two so as not to let it get too dry. Keep stirring so it doesn’t burn. Cook for 4-5 minutes in this fashion. You should see a lot of oil coming to the top of the curry. This is normal and shows you’re doing it right! When oil is rising and bubbling, add meat. Heat until chicken is cooked through, then add lime leaves, fish sauce and palm sugar. Keep cooking 3-5 minutes. Add additional coconut milk if dish ever gets too dry. When finished, remove from heat and add basil. Stir until mixed well and basil has wilted slightly. Serve topped with a spoonful of coconut cream and some sliced kaffir leaves. Kaffir Lime Leaves: You will not want to use a powder or dried leaves for this. If you cannot find fresh, just omit. Palm Sugar: Best option is palm sugar but if you can’t find it you can use a brown sugar (next best) or a white sugar (also good). 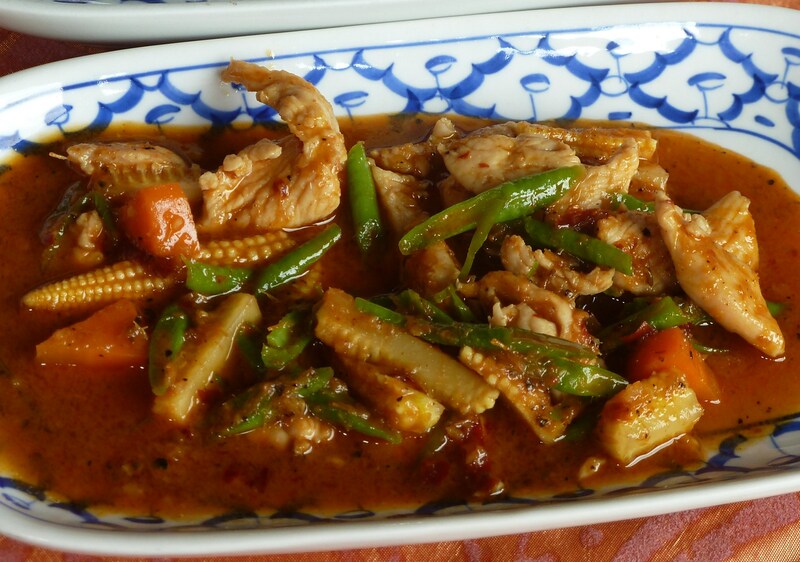 You can add any vegetables you want – baby corn, carrots, tomatoes, bamboo shoots, whatever you think would taste good!